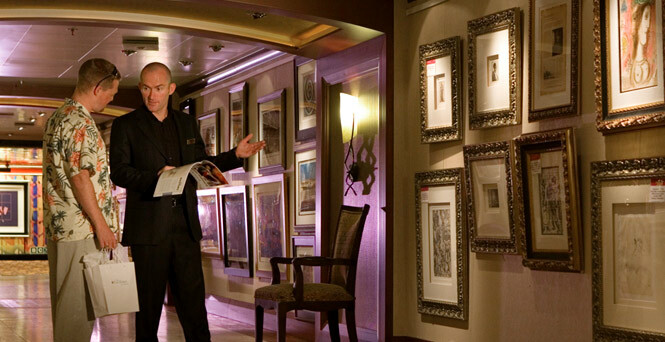 An ever-changing collection of fine art and limited-edition prints adorns our ships’ corridors. These works aren’t just pleasing to the eye — many are available to buy during our art auctions. Sip some champagne, browse the gallery, and bid on a piece to take home as a trip memento. These auctions feature works from the masters of the Renaissance to contemporary luminaries. A series of enrichment lectures and cocktail viewing parties, led by the art auction staff, typically precedes the auction, usually held at the end of the sailing. The collections include oil and acrylics paintings, water colors, drawings, hand-signed limited edition etchings, Lithographs, serigraphs and hand-embellished graphic works as well as a wide selection of autographed sports Memorabilia and a unique collection of rare animation art. The Art Auction Program is currently on the following ships: All ships (with the exception of Carnival Horizon and Carnival Panorama). Park West Gallery conducts the Art Auction Program. For post cruise inquiries, please contact Park West Gallery at www.parkwestgallery.com or 305 817-6400.